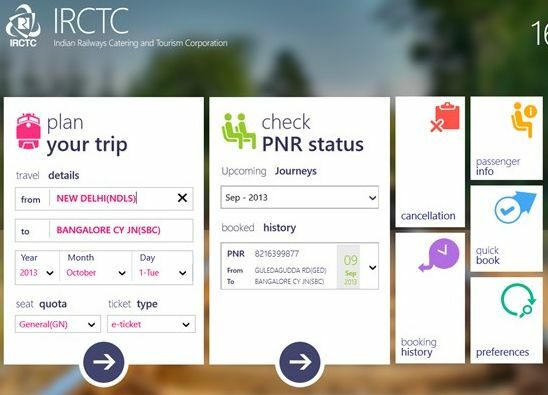 Indian Railway Catering Tourism Corporation (IRCTC) has launched its mobile application for Windows Phone 8 and Windows 8 devices. 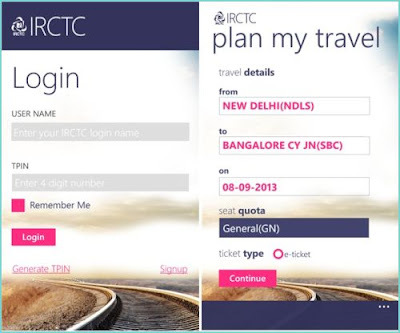 IRCTC website is the biggest e-commerce site in India and it is always in huge traffic, so getting tickets in IRCTC is very hard process for users. Recently they upgraded the site with high capacity server to handle 4.15 lakh tickets per day. 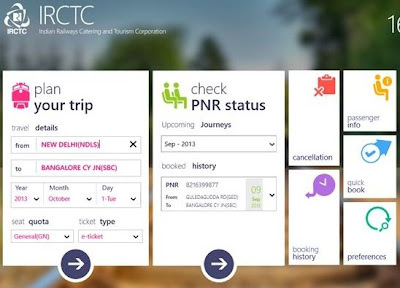 The app lets you to book train ticket and offers services such as PNR enquiry, train schedules and routes, ticket availability, cancellation and history also. Before the launch of these apps, you can only book the tickets on mobiles through their mobile site (m.irctc.co.in) but it has also some problems to work. The app built with Metro user interface so it looks good and easy to use. Note: The exclusive apps are available for Windows Phone 8 devices and Windows 8 only. There is a time limitation to book tickets so you can’t use this app between 8 AM and 12 AM or between 11.30 PM and 12.30 AM.